My eldest daughter finished up her (first) University degree in November last year and graduated late in December (a few days before Christmas). It's sort of the end of an era for her. She's now off to Med School at a different University and her friends are scattering to a variety of further degrees and other medical schools. So it seemed like a good time to make some of her best friends a little present to thank them for the last three years of dedicated friendship and to celebrate their massive achievement. The degree they just finished was NOT easy (and this from someone who lectures at a University. It is like an ordinary degree on steroids with many single units the equivalent of two units content at other universities. To survive and pass is hard enough. To achieve a 6+ GPA as many of them did is phenomenal). Actually, I really just wanted to have an opportunity to get the crochet hook out again and make some cute amigurumi. 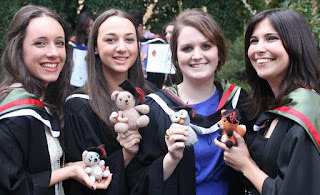 I found three cute graduation amigurumi patterns on the Lion Brand Yarns collection of free patterns: a Graduation Bear, a Graduation Owl and a Graduation Bookworm. I couldn't decide which one I liked best so I made all three. Then I adapted a couple of patterns to make a few more appropriate animals for the rest of the girls. The first one I made was Graduation Bear. He's made from 8ply (DK) from my stash, a vintage rustic pure wool called Herdwick. The cap and certificate used 8ply machine wash. I used a 4mm crochet hook for all of these amigurumi. He is about 14cm tall finished height. He's now spending time with another future doctor. I'm really proud. This photo has been chosen as one of the photos on the Ravelry page for this pattern. In front of an anatomy textbook. After all he is a Biomed bear. Bonus points if you figure out what the diagrams show! Then came Graduation Owl. I really love this one and since I made it, I have found so many cute owls out there that various talented craftspeople have made and posted photos of. It's amazing how you just need just a few elements to represent an owl - the eyes and beak and a basic body shape. The friend who received this one has a respectable owl collection already. I know where to send any future owls I make as I know I won't be able to resist making a few more. I have made my owl in different colours than those suggested in the pattern, greys rather than the original shades of brown. The owl is about 11 to 12 cm tall. Next I started making the graduation bookworm but he was very small (only about 5cm high and about 8 cm long from tip to tail) so I decided to adapt a few other amigurumi animals into graduation animals. I asked my daughter to come up with appropriate animals for the rest of her friends. So for a foxy lady, graduation fox came into being. I have previously made this particular amigurumi fox before for one of my daughter's best neighborhood friends who has always loved foxes. The pattern for the fox can be found at Nimoe's blog. Here is Nimoe's original fox. I also have to thank Nimoe for the suggestion to begin crochet with a magic adjustable ring. I start all my amigurumi this way now, less fiddly than joining chain into a loop. I made the fox with as per the pattern but with only one ear and then used the instructions for the graduation owl's cap. The finished fox is a similar size to the owl (11 to 12 cm tall). The final amigurumi was Graduation kitty. My daughter and her friend joke that they are going to end up as crazy old cat ladies living with an excessive number of cats. Think of Sheldon from Bing Bang Theory and his cats. Have a look at the following Youtube video of Sheldon and his cats if you don't know what I mean. Graduation kitty is massively adapted from a number of patterns. The basic head and body are from the graduation owl as is the cap. The arms and legs and tummy patch are from graduation fox. I made up the tail and ear as I went. Again this one is about 11cm tall. I did finish the Graduation bookworm after Christmas. This one is for my daughter. I've embroidered his eyes rather than using beads as suggested in the pattern. I added a chain to his tail so he is actually a key ring. However, I think I may move the chain to the top of his cap as you can't really see his face when he is hanging from his tail. And here's my ecstatic little graduate. I think she is trying to fly!